Let's See Your Concrete Floor! E-mail your photo to: ConcreteFloor@CentiMark.com or upload your photo using the form below and your company will receive two entries for the Samsung Mini Tablet. The Samsung Mini Tablet will have our proprietary online database - MyQuestMark - along with our online catalog for all your flooring needs. Common issues with concrete floors include stains, dusting and dullness. Additional serious concrete floor problems include: holes, cracks, joint problems, uneven sections, exposed concrete, delaminated coatings and failed overlayments. These problems also cause safety issues, trip hazards and potential OSHA-violations. When we evaluate your floor, we’ll examine your conditions and work with you to provide solutions within your budget. Then our QuestMark crews will perform a DiamonQuest demonstration on your floor. It’s a no-risk solution to solve your flooring problems! Do Heavy Rains Weigh On Your Roof? 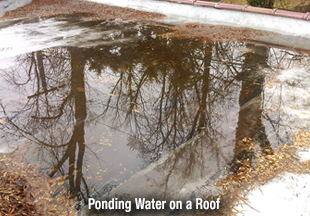 A good roof system with proper drainage is essential to help remove water from your roof. Did you know that a single gallon of water weighs 8.34 pounds? One inch of rain on your roof weighs about five (5) pounds per square foot! Imagine when you have heavy, pounding rains where substantial amounts of water accumulate quickly on the roof surface! Excessive water on your roof can compromise and overload a building’s structure and may result in structural failure or collapse. A good roof system removes water through slope to drains, wall scuppers and/or gutters and downspouts. It is essential that all of these remain debris free and are properly sized and fitted to direct water off the roof surface. Don’t wait for a roof leak to determine if your roof drainage system is working correctly. Schedule a roof inspection, repair existing leaks, clean debris from gutters and downspouts and verify that the other roof components are working properly at least twice per year. A regular Preventative Maintenance Program costs $.01-$.03 per square foot and can help extend the life of your roof. That’s one of the reasons our two-person service crews identify roof leaks with GPS coordinates for documentation. The easiest leaks to find are those that are actually visible. More often you may see stains on a ceiling, but that does not mean you can easily find the roof leak. If a leak results in a couple of drips, it’s hard to find. It seems like common sense that when you see ceiling stains at a particular location inside the building that the roof leak would be directly above that stain. But water does not necessarily drip straight down. Sometimes, water moves downslope along the roof, then soaks the insulation before leaving a noticeable stain on the ceiling. Sometimes what may appear to be a roof leak is not, it is caused by something other than a roof leak. Some of these apparent roof “leaks” are actually drips caused by the HVAC system, plumbing defects, windows leaks or condensation. Often, a combination of some or all of these factors may be causing water drips and/or leaks. It is essential that the gutters and downspouts remain debris free and properly are sized and fitted to direct water off the roof surface. 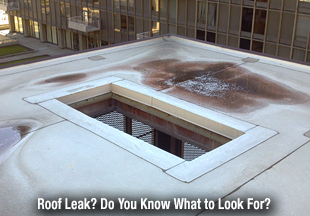 Don't wait for a roof leak - Be proactive! Don’t wait for a roof leak to determine if your roof drainage system is working correctly. Schedule a roof inspection, repair existing leaks, clean debris from gutters and downspouts and verify that the other roof components are working properly at least twice per year. Roofs fail for a number of reasons: excessive moisture, extreme temperature fluctuations, pollution, grease, lack of maintenance and/or repair. A CentiMark roof inspection will evaluate flashings, edge details, copings, pitch pans, drains and gutters. We’ll look at energy efficiency improvements and make rooftop safety recommendations. Again, keep in mind, a regular Preventative Maintenance Program costs $.01-$.03 per square foot and can help extend the life of your roof. Click Here for a Roof Inspection! Plant Shutdowns Are Close! Let’s Set A Date! It is a time to do the work that cannot be performed during normal business operations. For facilities, scheduled shutdowns are necessary to maintain plants and equipment. The results of the shutdown include: aesthetic improvements, less equipment failures, increased facility compliance with governing agencies (safety, OSHA, USDA) and improved production. Plant shutdowns are usually short and intense for all parties involved in the work! Contact QuestMark to schedule your flooring work! It’s not too early to set your date for Thanksgiving and Christmas holiday plant shutdowns. All facility managers should work closely with their vendors to ensure a successful plant shutdown experience. At QuestMark, we have a 46 year history of "Lessons Learned" during plant shutdowns. Get us involved early in the project when you are scheduling flooring work. Let us support you and help create a plan of action. Our experienced Project Managers will review the steps of the shutdown and the scope of work (SOW) and help you execute the plan. Planning, planning, planning. Start planning for your next shutdown as soon as the last shutdown is complete. Prepare a list of items and prioritize - knowing that all items may not be completed. Share your list with your team at the plant and with all your vendors and suppliers. Have a back-up plan for problems: power outages, parts on backorder, breaking pieces, weather and things beyond your control. Contingency plans are just as important as the primary plan. Communication is the key to success. Everyone needs to know the schedule for the plant shutdown and the specific impact to their respective areas. Representatives from each department should be at the planning meetings. If you have vendors coming in to do work, make sure they are also at the planning meetings that pertain to their specific areas of work and the departments they will be working with during the shutdown. 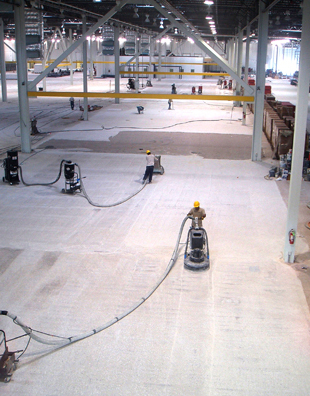 Pre-planning is like floor preparation for epoxies…it is THE SINGLE MOST IMPORTANT STEP. The last thing you need to hear from a vendor or supplier is that they will not be ready or a part was never ordered or a PO (Purchase Order) was not generated. Cross your “T’s” and dot your “I’s” and throughout the purchasing process. During the Planning Phase (Phase 1), identify the parts, processes, systems, services and vendors that you will need for each step of your shutdown. Identify the owners who are responsible for each process - Department Head, Procurement Group, Facility Manager or Maintenance Manager. Make sure that everyone is clear on their role, responsibility and deadline. Follow-up to ensure tasks are completed. Otherwise, you are vulnerable to surprises during your shutdown and, at that point, it may be too late. At this point, you know what you want to accomplish. Assignments have been made and schedules and deadlines have been set. Vendors have been coordinated and materials have been ordered. Now, it’s time to execute the plan. The best way to execute the plan is to have a final meeting with all vendors, suppliers, departments and company staff that will be managing the shutdown. Do this BEFORE the actual date of closure to make sure that all parties know what their roles are and when they are expected to execute their tasks. This level of communication and planning will help to ensure you get the most return from your shutdown.